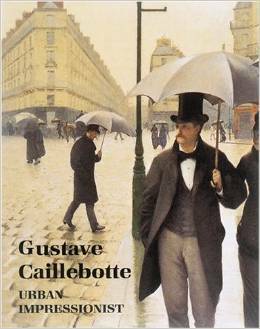 I feel like I’ve known Gustave Caillebotte (1848-1894) ever since I was a young art student on a bus trip to the Art Institute of Chicago. 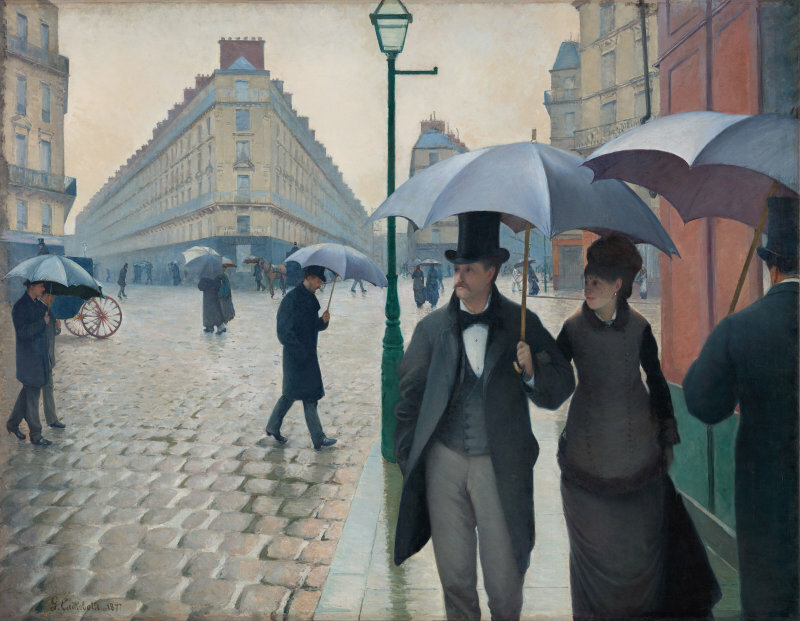 That is where I first saw his very lovely Paris Street; Rainy Day (1877). So when I first arrived in Paris, I couldn’t help going to the site of Paris Street; Rainy Day in the Place de Dublin behind Gare Saint Lazare. 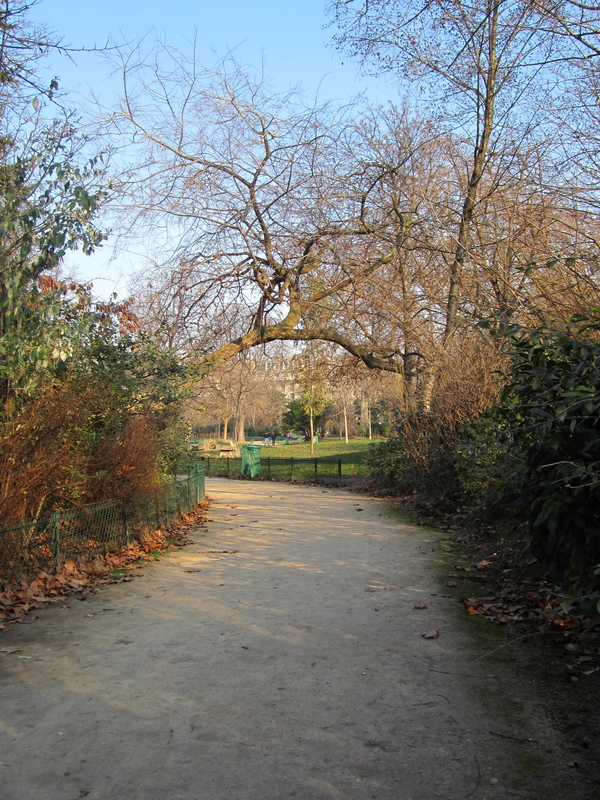 What I didn’t know at the time of my first visit to the Place de Dublin was that I could trace Caillebotte’s footsteps from that scene to the scenes of many of his other paintings, all around his old neighborhood in the 8th arrondissement of Paris. From the Place de Dublin, it is a short walk down rue de Saint-Pétersbourg to the Place de L’Europe which overlooks Gare Saint Lazare, the train station that was the site of many Impressionists paintings. 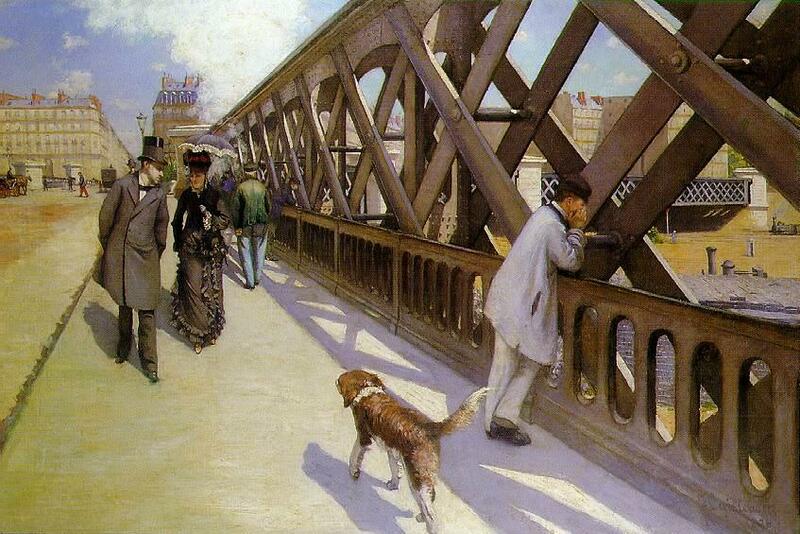 Caillebotte painted an interesting urban scene on the bridge (below) and exhibited the painting in the Second Impressionist Exhibit of 1876. 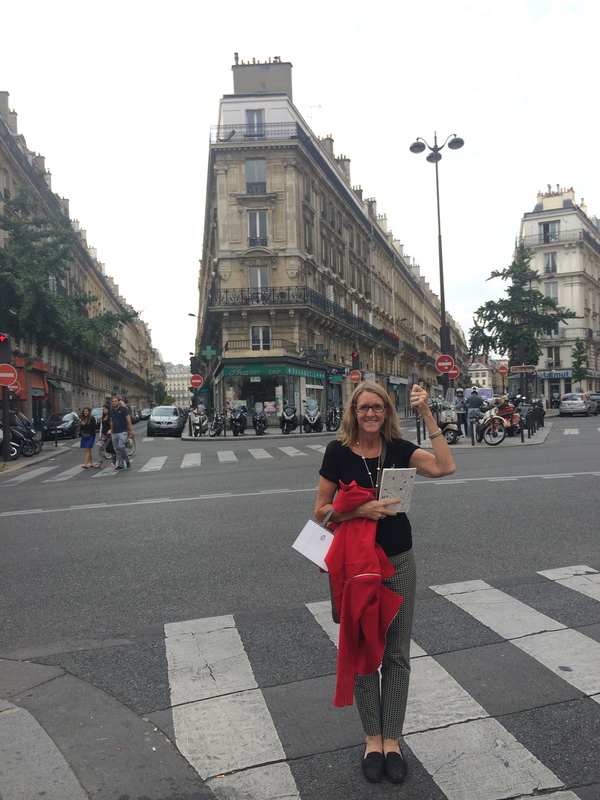 From the Place de L’Europe, it is just another short walk down rue de Madrid to the lovely neighborhood where the Caillebotte family lived. 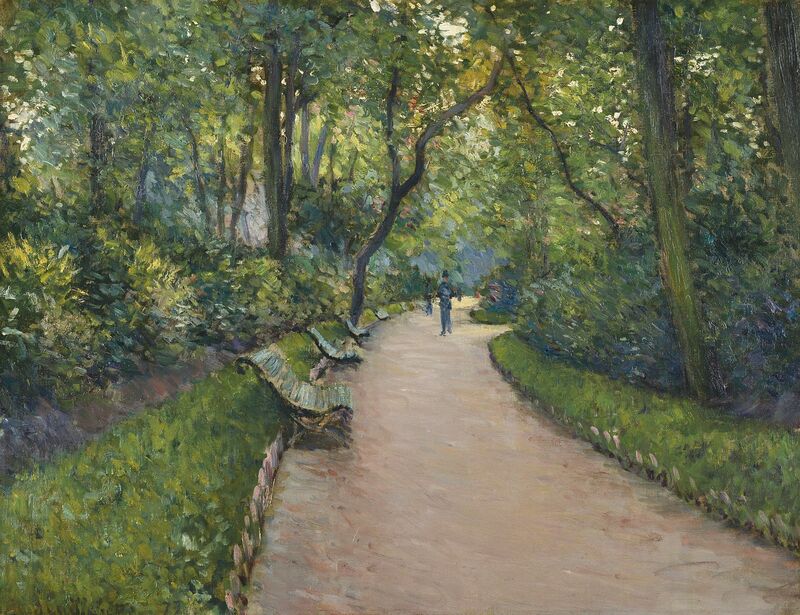 In 1866, Gustave Caillebotte’s father bought a plot of land in the nouveau riche neighborhood near Parc Monceau and built a lovely three story townhouse (two more stories would be added after the Caillebottes no longer lived there). 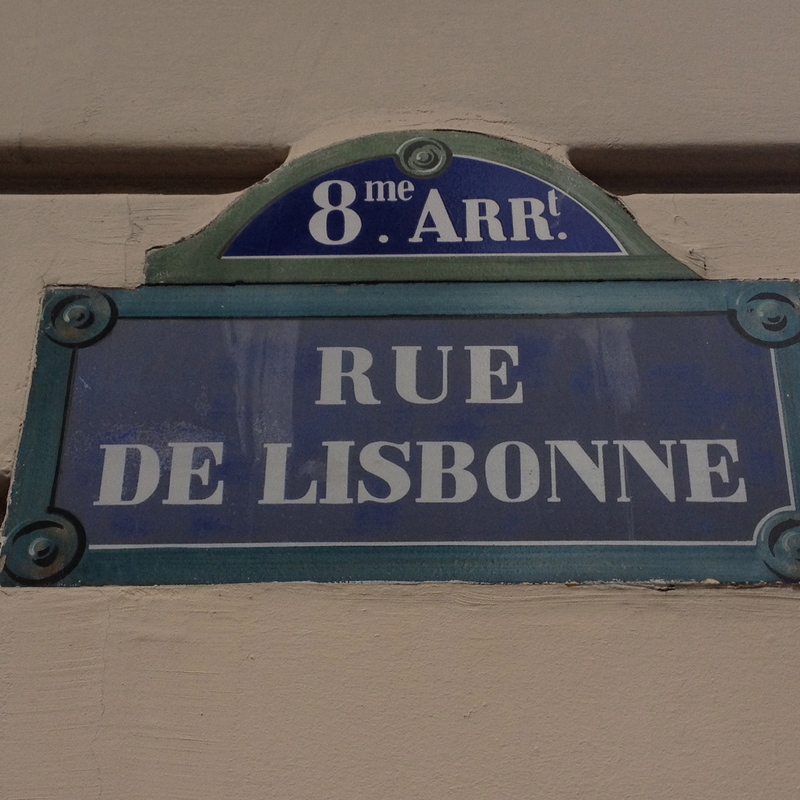 It was located on the corner of rue de Miromesnil and rue de Lisbonne. It actually shares two addresses: 77 rue de Miromesnil and 13 rue de Lisbonne. 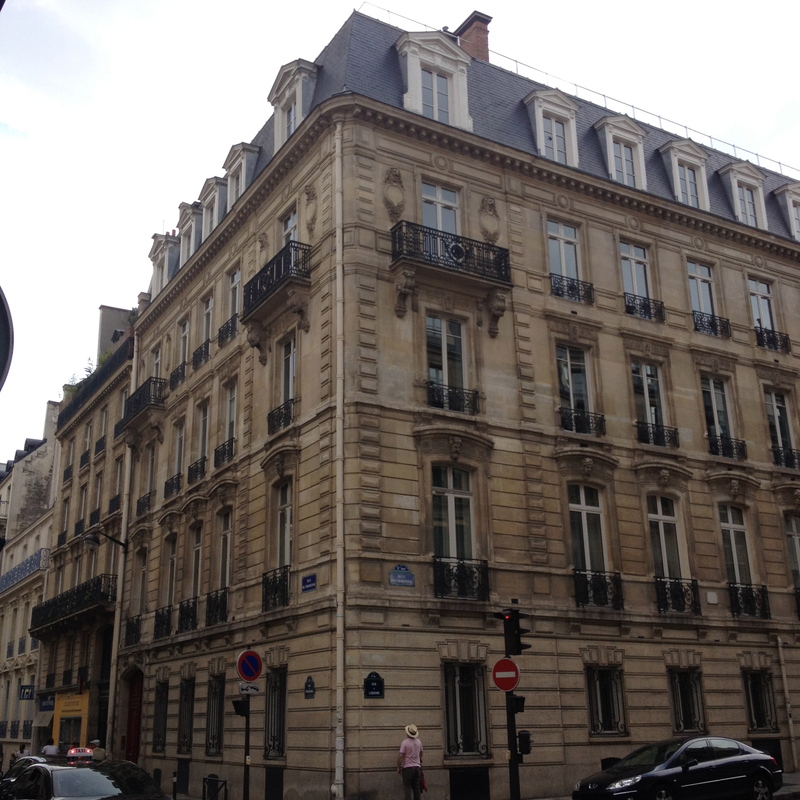 This is where Gustave Caillebotte lived with his parents, his brothers and their servants. The corner of rue de Lisbonne and rue de Miromesnil in Paris, once the home and studio of the painter Gustave Caillebotte. Before his death in 1874, Caillebotte’s father Martial built an atelier within the family compound for his artistic son. (Which must have been a true sign of paternal support. Gustave had studied law but preferred the study of art to the practice of law.) It was built on top of a two-story loge used by their concierge, located to the right of the carriage entrance on rue de Lisbonne. Although nothing is left of this structure today, the atelier once consisted of two floors. The top floor had a high-vaulted ceiling, a north-facing skylight, a balcony facing the rue de Lisbonne and French windows to the south. The complex lighting of The Floor Scrapers – soft backlighting from the visible window amid a cool, even, interior light – accords perfectly with the studio’s configuration and suggests that Caillebotte was keen to record the good light of his new work space. At about the same time, Caillebotte painted his younger brother René standing at one of the windows of the family townhouse. Young Man at the Window was also shown at the Second Impressionist Exhibit. Unfortunately, René would die later that same year. When their mother died just two years later, in 1878, Gustave and his remaining brother Martial moved to a new apartment on Boulevard Haussman. If you look closely at Young Man at the Window and compare it to the photograph of this building today (above), you can tell that René is standing in one of the corner windows facing rue de Lisbonne, with the intersection of rue de Miromesnil and Boulevard Malesherbes in the background. There was once a stone balustrade in front of this window instead of the iron railing that exists today. In any event, we can be pretty certain that this was not painted in Caillebotte’s new studio, which was located not on the corner, but a little further down rue de Lisbonne. 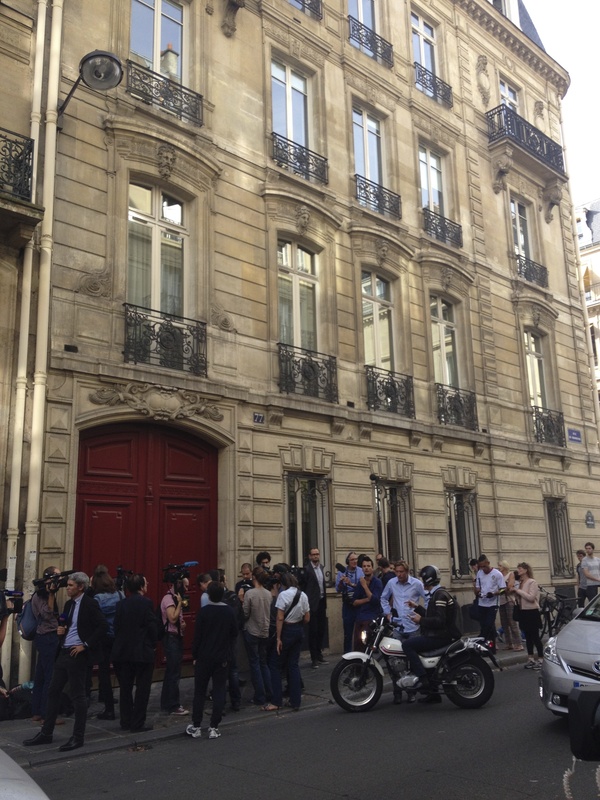 Caillebotte’s former townhouse, 77 rue de Miromesnil, is now occupied by France’s ex-president Nicolas Sarkozy. His office is located on the first floor (second floor to Americans). 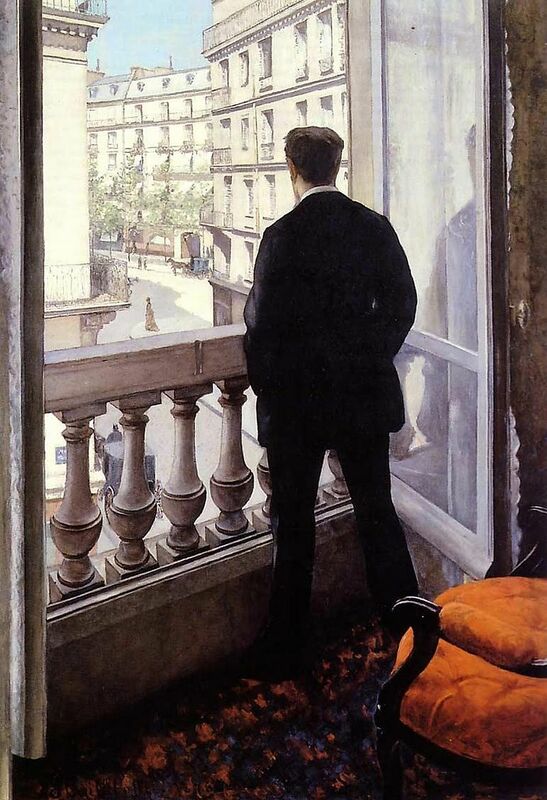 So I have to wonder, does Sarkozy ever stand at the window with his hands in his pockets like René Caillebotte? 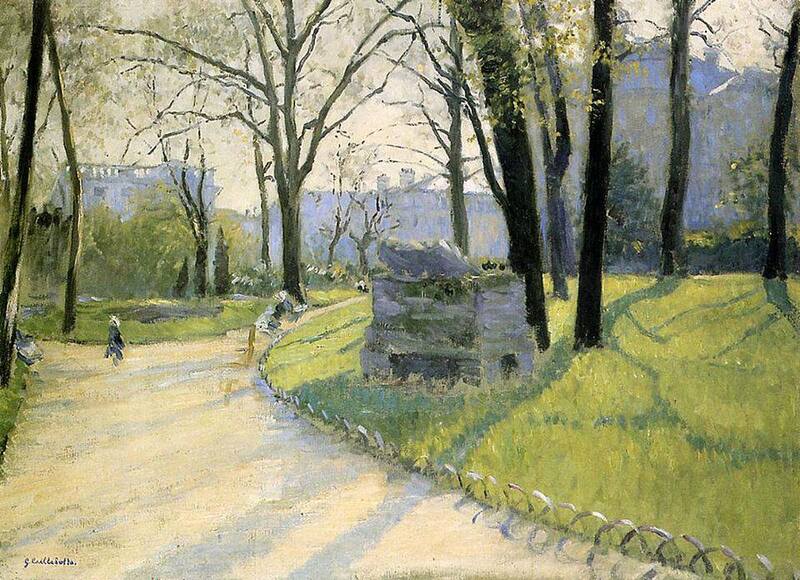 Gustave Caillebotte, Le Parc Monceau (1877) – sold in a 2013 Sotheby’s auction for 2.6 million pounds. 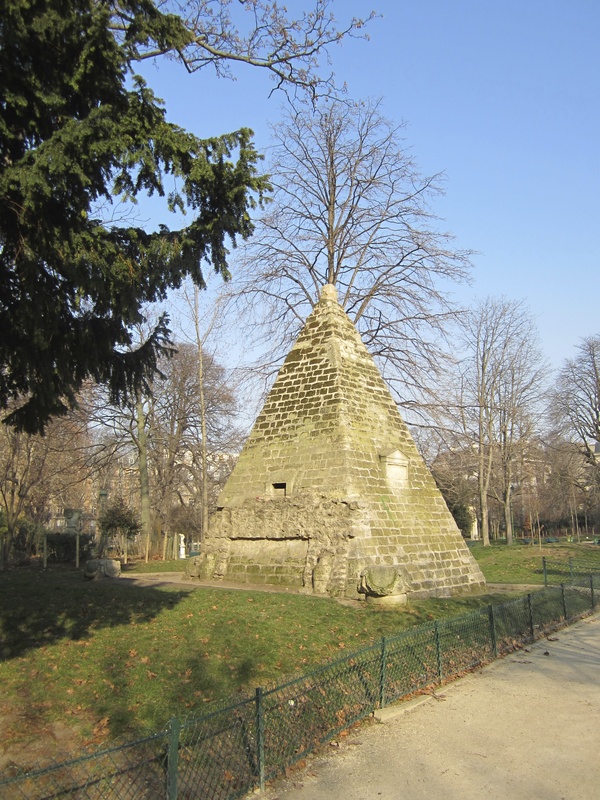 One of Parc Monceau’s “follies” – architectural features of interest from different continents and cultures, as designed by Louis Carrogis Carmontelle in 1778. 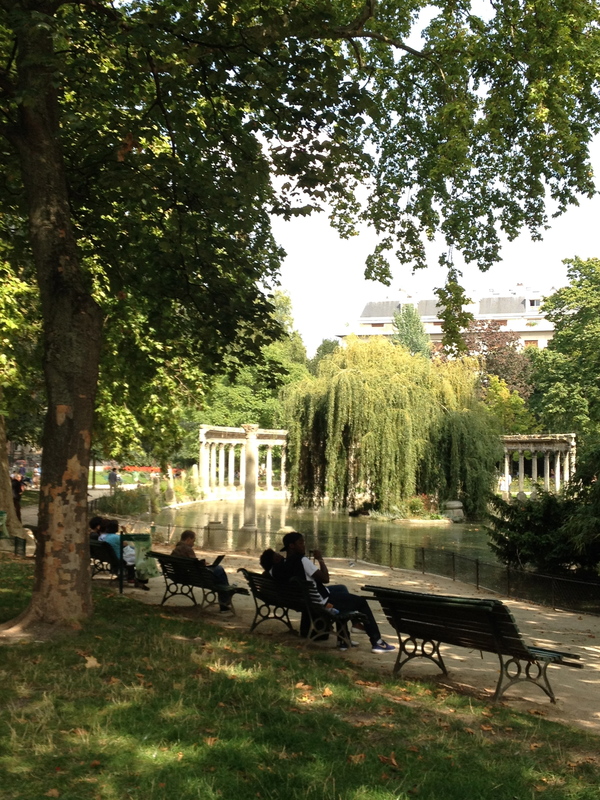 The Corinthian Columns, Parc Monceau in September. 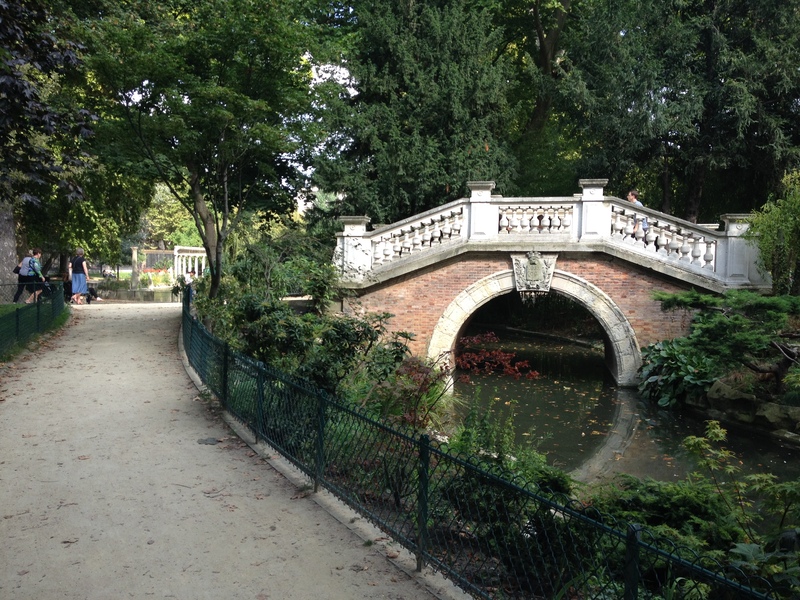 Parc Monceau: a bridge designed by Haussman era architect Gabriel Davioud, modeled after the Rialto bridge in Venice. To finish off what could be a perfect day of all things Caillebotte, I would head over the the Musée D’Orsay to enjoy all of the Impressionist paintings that were part of the Caillebotte Bequest of 1894. 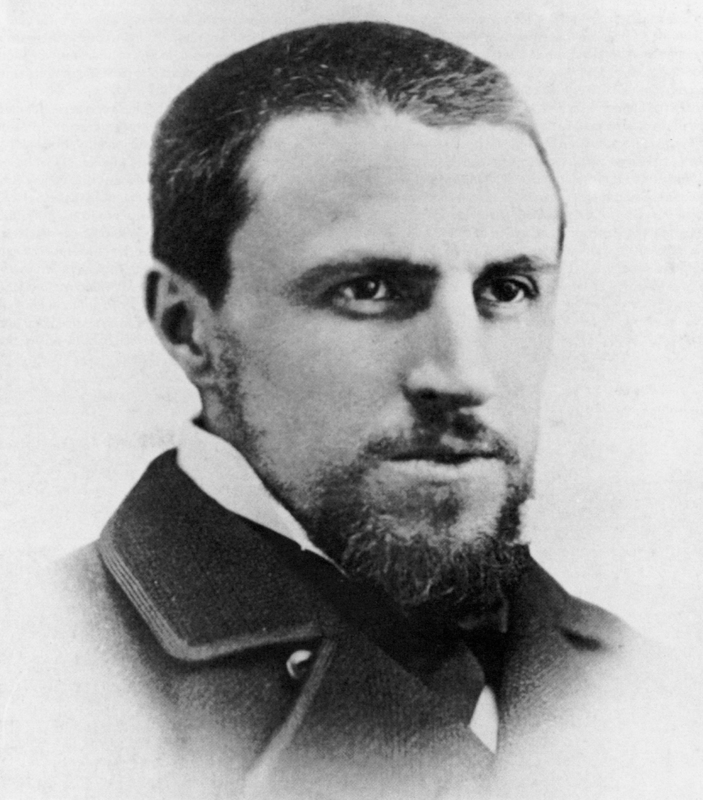 By the time of Caillebotte’s death (he was only 45 years old) he had become a leading collector of Impressionist art and one of their most helpful patrons. His bequest to the French government included 67 paintings from artists such as Cézanne, Renoir, Monet, Manet, Sisley and Pissaro. Although the French government refused to accept part of the bequest, those that were accepted now form the heart of the Impressionist Collection of the Musée D’Orsay. While you’re there, be sure to take an extra moment in front of The Floor Scrapers, and take pleasure in knowing that you’ve walked down the very street where it was painted back in 1875. 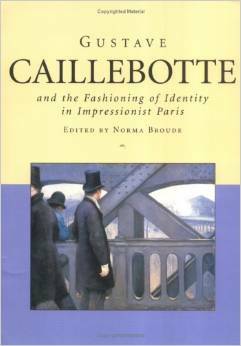 Gustave Caillebotte, Urban Impressionist, edited by Anne Distel, Art Institute of Chicago (1995). Also recommended: Paris Walks Impressionist Walking Tour, April 2015 schedule here — ParisWalks.com holds a “Paris of the Impressionists” Tour almost every month.